The American DJ Inno Color Beam 12 at first looks is unassuming. It appears to be just another moving head. Matter of fact, we were reminded of the days when there used to be a light called an ossilight that was no more than a pinspot on a motor that scanned the crowd. We decided to take Inno Beam 12 off the bench to the street and live performances to see how it holds up to all the rumors that have floated around the trade shows. Our first event was a school event for over 500 students in a gymnasium. We discovered earlier on in our initial setup that the Inno Color Beam 12 is a versatile light that, with the use of DMX, can be pushed to its limits. Our setup was simple. We placed one Inno Color Beam 12 on top of each of our speakers and wired them into our DMX line that was controlled by a MyDMX system. We thought having space between them would give more of a wow effect and allowed us to setup a number of programs that the Inno Color Beam 12s would fit nicely into. Talk about searchlight bright! The Inno Color Beam 12s cut through the darkness of the gym giving us tight colorful beams of light that reach the far corners of the room. The motors on these lights are wickedly fast to the point you almost thought the head was going to spin right off and they danced to the music. That night we also set up a program to use them for a spotlight. This gave us a nifty second use for the Inno Color Beam 12s at an event that our clients appreciated during their royalty walk. Our second event took place in a much smaller venue with a lot lower ceilings. This time we mounted the Inno Color Beam 12s on top of our Global Truss Totems. It was a clean look. There was something about the moving beam that added excitement to our show. Like we had with the school function, we preprogrammed different sets that put the lights through their paces and one of those programs included a spotlight. This time the venue came with a built in mirror ball so we were able to use the Inno Color Beam 12s as high powered pin spots. When they lit up the mirror ball, it gave us laser like beams of color that engulfed the dancefloor and the room. Another note we need to point out is that with lighting these days, your want to find the brightest because you can always use DMX to dim them if needed. Using the Inno Color Beam 12s in the smaller venue, we did take that path and dimmed them a small amount except for when we spot lit the mirror ball. At only 12lbs each and very compact, they fit nicely in an Arriba ACR-19 rolling bag. The Arriba bag gave them more than adequate protection and made for a nice clean looking way to transport them. 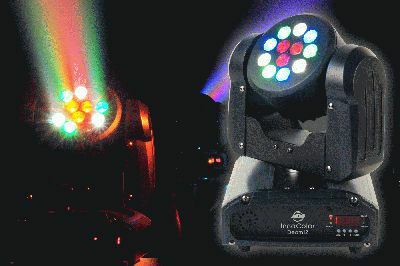 The Inno Color Beam 12 with its 12x 3-Watt LEDs may have initially taken us back to thoughts of a light we used to own, but that ended very quickly when we really got it out and used it. It's an impressive bang for your lighting buck.